On the furthest tip of the point: pristine water and excellent food! From the times of the Ancient Romans, when the Empire's elite classes regularly came to spend their summer vacations here, Nerano's beach of Marina del Cantone has been attracting holidaymakers with its warm, crystal clear waters, in which bathing is feasible from early April to late October. 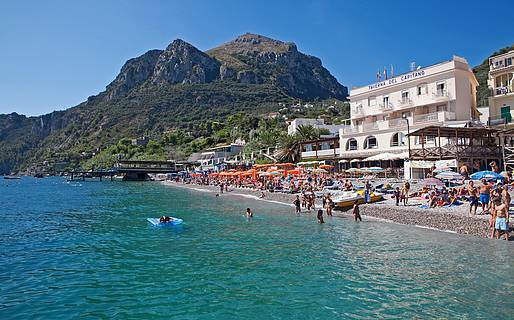 Marina del Cantone is a large beach with free areas, bathing establishments and restaurants built on platforms above the sea. Protected from the wind by the mountains, the south facing beach is a warm haven from late March until late October. The water is always incredibly clean and refreshing. The sun sets over the left hand side of the beach the sun sets almost an hour later than over the right hand side (known as "The Germans' Beach"). 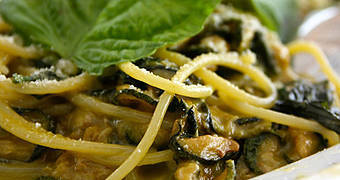 All the beachfront restaurants feature the local specialty spaghetti alla Nerano on their menus, a dish created here based on pasta, zucchini, and cheese. The original version is said to have been first served at the Da Mariagrazia restaurant, but it is excellent no matter where you sample it. It may not be lightest of lunches, but it's worth the sacrifice! From Marina del Cantone a short, 10 minute walk leads to Recommone bay. This gorgeous little bay, perfectly sheltered from the wind, is home to the Conca del Sogno, restaurant and bathing establishment. The bay also has two caves: the Grotta di Recommone and the Grotta dei Pescatori, both of which offer holidaymakers a wonderfully cool refuge in the hottest hours of the day. By car: from Sant'Agata sui Due Golfi take the road to Nerano. There are a number of car parks in the vicinity of the beach. You can expect to pay about 10 euro for a day's parking. By public transport: the Sita coach company operates buses from Sorrento to Sant'Agata - Nerano. In the summer, boat connections are available from Sorrento, Positano and Capri. 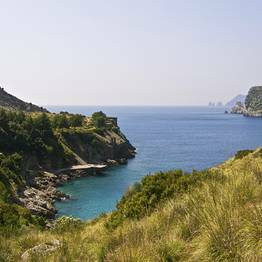 Ieranto beach is located at the end of the footpath which, from Nerano, heads towards the point where the Amalfi Coast meets the Sorrentine peninsula. Situated on the eastern side of Campanella Point, the place was considered so sacred by the Ancient Greeks, that they erected a temple here. The Ancient Romans used the temple as a house of worship dedicated to the Goddess Minerva.The footpath, which commences in Nerano, is circa 2 kilometers long and takes just over an hour to complete. The uphill return journey (not to be undertaken during the hot central hours of the day) takes considerably longer. 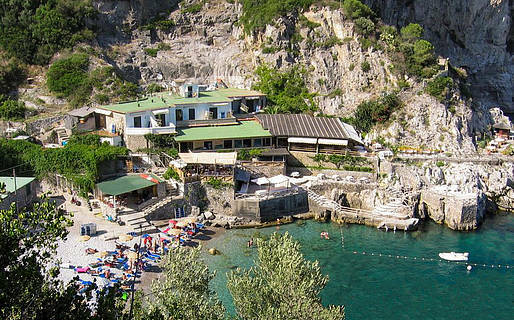 The beach is situated in a little cove directly opposite the island of Capri's legendary Faraglioni. By car: in Nerano, close to the start of Via Ieranto, you'll find a small car park, where you can pay to leave your vehicle. 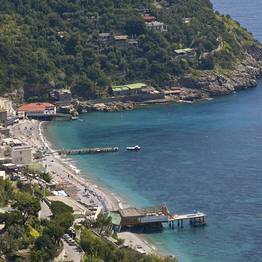 By public transport: the Sita coach company operates a bus service from Sorrento to Nerano. 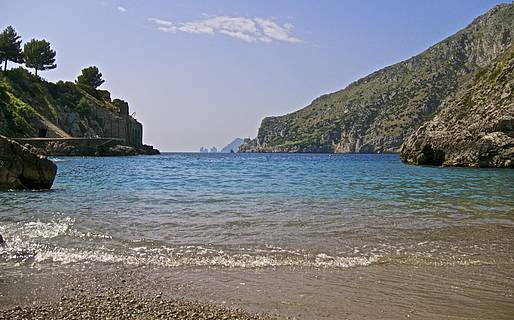 Ieranto bay is situated inside the protected marine park of Punta Campanella. The only boats allowed to sail inside the park's borders are those belonging to the Sant'Antonino cooperative; these depart from Nerano.